Where’s the F@%&#@ Game? — Are You Watching This?! I hope that features will be coming out fast and furiously over the next few weeks, but tonight I’m making sure everyone knows about an oft-overlooked one. There’s a football game on tonight. Yes, I know most people can’t see it because of this NFL Network foolishness (I’m looking at you too Big 10 Network! 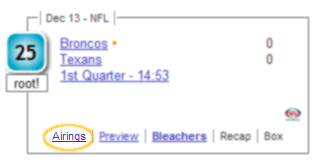 ), and granted Broncos vs. Texans isn’t exactly must-see TV (it’s Cutler vs. Rosenfels, people! ), it’s a slow night in the sports world so you may be wondering where you can see it. Before you hop in the car and head to the nearest sports bar, remember you can click on “Airings” on any game page and see which of your buddies has the game on TV, and more importantly, whose couch you need to invite yourself to. Sure, you can get Social Networking anywhere, but how many sites give you Couch Networking? Thought so. Don’t forget who loves ya baby.